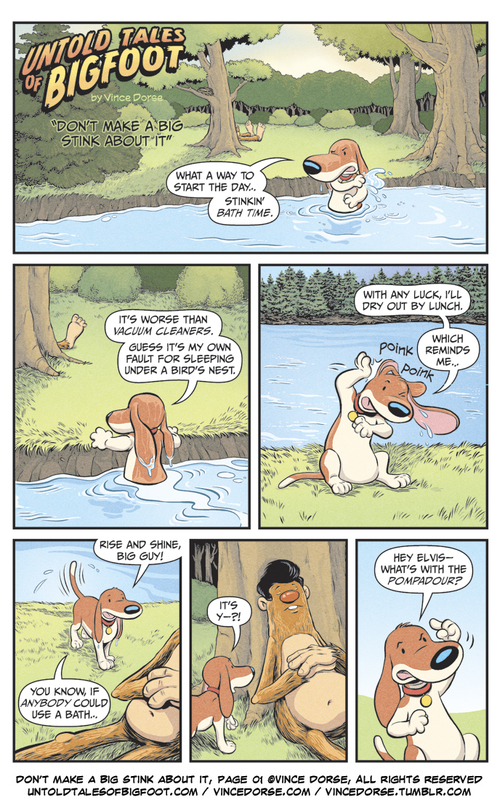 Untold Tales of Bigfoot: Don’t Make A Big Stink About It! Well, there you go. No savage mountain lions or bloodthirsty wolf packs for Bigfoot and Scout this time. 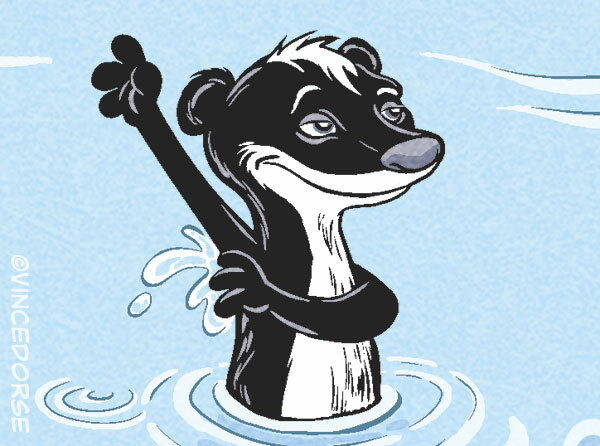 Just one jumpy skunk. It’s been a while since the drawing board’s been clear enough for me to work with Bigfoot & Scout, but it felt great. Like coming home again. I wanted to ink and letter the comic in MangaStudio, something I’d never done before. The inking went alright, but MangaStudio‘s lettering engine is just too klunky and I ended up re-doing the word balloons in Illustrator. Sooner or later I’ll streamline this process. I did have a lot of fun with the sneeze panel. I shy away from drawing stuff that might lean toward “gross”, but sound effects are fair game. I just let the readers’ imagination do all the heavy lifting. Hey Elvis, What’s with the pompadour? 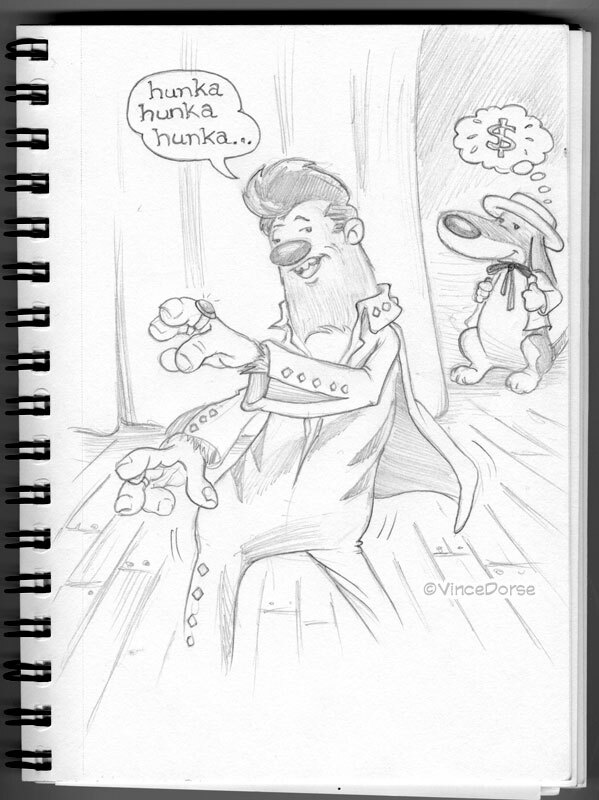 This comic was inspired by a doodle in my sketch book where Bigfoot is Elvis and Scout is a money-hungry Colonel Tom Parker. Bigfoot looks so great in that pompadour I had to find a way to put it in a comic (plus, the word pompadour is just funny). Here’s the sketch. Over the last year, I’ve had months-long email exchanges with at least three different publishers who showed a lot of interest in UTOB, loved the story and art in UTOB…and then chose not to publish UTOB. As Scout would say, “Fudgepops!” No visionary publishers or animation studios have appeared on the horizon wanting to make a bazillion dollars with me, and I think Bigfoot and Scout are tired of waiting. So I’ll probably be taking things into my own hands by running a crowd-funding campaign in the new year to get Untold Tales of Bigfoot: Book One printed. Watch this space (or the UTOB Facebook Page) for all the news on that. Your support, as always, will be invaluable. Since it’s the holiday gift-giving season, I should let you know there are a couple new shirts in my Zazzle Shop. There’s the brand new “One Good Friend” design (with both dark & light colored shirt options) and a revamp of the “Wave” design that’ll work on most colors, dark or light. The old designs only worked on black or white shirts, but I thought it was about time we added some color to the place. Untold Tales of Bigfoot Shirts available in my Zazzle Shop! 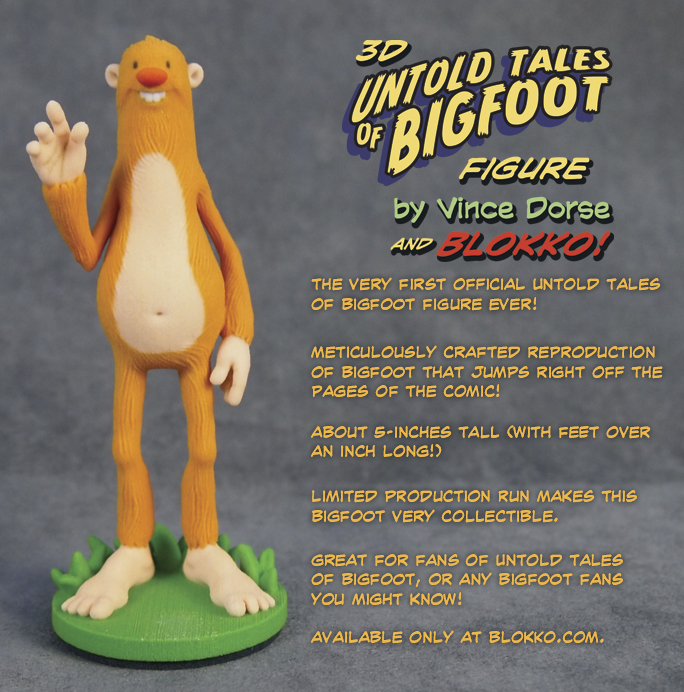 And, of course, Blokko is still offering the ultra-cool, highly-collectible 3D-printed Bigfoot figure! This is one of my favorite things to come out of working on this comic. This genial giant represents all the best parts of us — friendship, peace, loyalty. A nice gift for a good friend. And, if I’m not mistaken, there’s still a 10% discount with the code FORSCOUT. Just head over to Blokko to pick one up.